Although Horse of the Year Mineshaft (by Horse of the Year A.P. Indy) had a good weekend with Grade 2 Gotham Stakes winner J Boys Echo, Mineshaft’s son Dialed In had a great weekend. 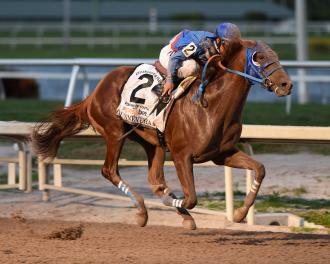 The Darby Dan Farm stallion fielded a pair of stakes winners from his first crop of 3-year-olds, led by G2 Fountain of Youth winner Gunnevera, who was a multiple stakes winner at 2 and had been a good-looking second in the Holy Bull Stakes last month at Gulfstream Park.